The US segment of the ISS actually features three separate external cooling systems, all of them independent of one another, which serve different elements of the overall cooling architecture. The main cooling system is known as the External Thermal Control System (ETCS). 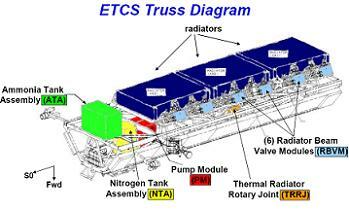 The ETCS features six separate radiators, called Heat Rejection Subsystem Radiators (HRSRs). 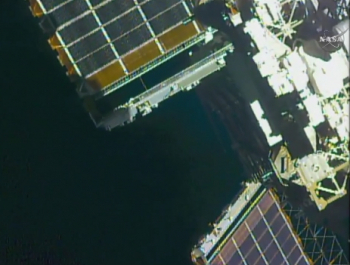 The HRSRs are separated into two groups of three radiators, with one group located on the Port 1 (P1) Truss, and the other located on the Starboard 1 (S1) Truss. Each group of HRSRs service a separate loop of the ETCS – which are Loop A, and Loop B. Each group rotate to face away from the sun, in order to improve their cooling efficiency, via the Thermal Radiator Rotary Joint (TRRJ). 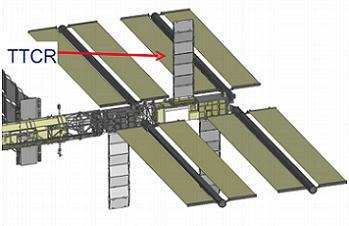 Only one spare HRSR is located on the ISS. While the ETCS is responsible for dissipating the heat generated from the internal and external electrical equipment located on the USOS, the cooling architecture is complicated by the fact that the station’s solar arrays and associated power generation and distribution equipment generate their own heat load. However, since the solar arrays must rotate in order to face the sun via the Solar Alpha Rotary Joints (SARJs), it would be extremely difficult to transfer ammonia coolant across the rotating joints in order for the heat to be dissipated via the ETCS. As such, each one of the four power generation Truss segments (P4, P6, S4, S6) has its own individual cooling system, called the Photo Voltaic Thermal Control System (PVTCS), with each system serviced by its own dedicated radiator, called a Photovoltaic Radiator (PVR). The PVRs differ from the HRSRs in that the PVRs are smaller and have less cooling loops than the HRSRs, which are designed to dissipate a larger heat load than the PVRs. Thus, an HRSR spare cannot be used as a PVR spare, and vice versa. The cooling system architecture is complicated further by the fact that, unlike the S4, S6, and P4 Trusses, which all have identical PVTCS architectures, the P6 Truss has a slightly different cooling architecture. 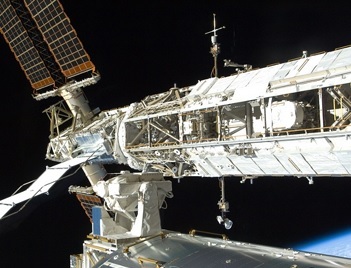 This is due to the presence of the Early ETCS (EECTS), which was used to cool the ISS during the early years of ISS construction, when the main ETCS loop was not yet constructed and fully online. At this time, the P6 Truss was located atop the Zenith 1 (Z1) Truss. 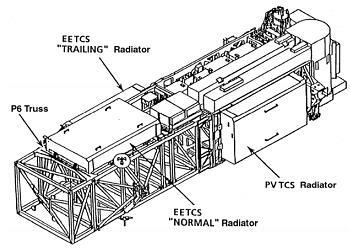 The EETCS featured two Thermal Control Radiators (TCRs) that were both of the same construction type as the PVRs, with the two TCRs being denoted as the Trailing TCR (TTCR), pronounced “ticker”, and Starboard TCR (STCR), pronounced “sticker”. When the main ETCS loop was brought online however, and all six of its HRSRs were deployed, the TTCR and STCR were retracted as they were no longer needed, prior to the P6 Truss being relocated from its previous home atop the Z1 Truss, to its current home on the end of the P5 Truss. Although the TTCR and STCR are no longer needed to provide cooling to the ISS, since they are both of the same construction type as the PVRs, they can be used as spares for the PVRs should such a situation ever be required. Since 2006, ISS flight controllers were tracking a slow ammonia leak in the channel 2B cooling loop in the P6 PVTCS PVR, and in June 2012 flight controllers noticed a sharp increase in the leakage rate, although in relative terms the leak was still very small. However, the leak was still large enough for the ammonia in the channel 2B cooling loop to hit its minimum quantity limit within around six months, whereupon channel 2B would have shut itself down as a protective measure. At the time, flight controllers believed the leak was likely a second leak, rather than a worsening of the original leak, caused by a debris strike to the P6 PVR. As such, in November 2012 an EVA was conducted to isolate the suspected leaking 2B coolant loop in the P6 PVR, and instead deploy and utilize the unused TTCR for channel 2B cooling. It was always known that this measure may not work, as it could not be confirmed that the leak was in the PVR – flight controllers also believed that the leak may have been in an external cooling line, or in the 2B Pump Flow Control Subassembly (PFCS). Unfortunately, just six months after the EVA to attempt to stop the leak, in May 2013 a large increase in the leakage rate from channel 2B occurred. This led to a contingency EVA being performed to replace the channel 2B PFCS. This did the trick, and finally stopped the leak in the 2B power channel. Since then however channel 2B’s cooling has continued to be provided by the TTCR, despite the PVR being proven to not be the source of the leak. This is an undesirable configuration to be in, as it leaves both the PVR and TTCR deployed and exposed to debris strikes, thus needlessly exposing the TTCR – which serves as a spare for any of the four PVRs – to risk of damage. As such, the ISS program would like to Return To Original Configuration (RTOC) the P6 PVTCS, by transferring channel 2B’s cooling from the TTCR back to the PVR, and stowing the then unused TTCR in order to protect it as a spare for the future. This EVA – designated US EVA-33 – was performed by NASA astronauts Kjell Lindgren as EV-1, wearing the suit with the red stripes, and Scott Kelly as EV-2, wearing the all-white suit. Upon egress from the Quest airlock, Kelly brought out a tool bag from inside the airlock, while Lindgren retrieved a vent tool bag stowed on the Zenith side of the airlock exterior. 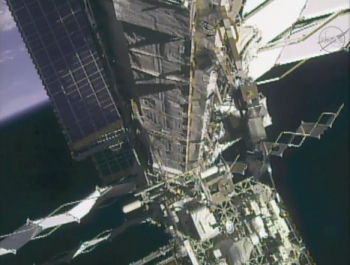 Both spacewalkers then translated to the worksite on the P6 Truss. The first order of business was for Lindgren and Kelly to remove a cover on the Fluid Quick Disconnect Coupling (FQDC) box near to the P6 PVR, and drive a bolt to open a valve in order to allow channel 2B’s ammonia coolant to flow into the PVR. The FQDC cover was then replaced. Lindgren demated and stowed a jumper to isolate channel 2B from the TTCR, meanwhile Kelly headed to the P3/P4 Truss to install an ammonia fill jumper across the SARJ (which was locked for this EVA). 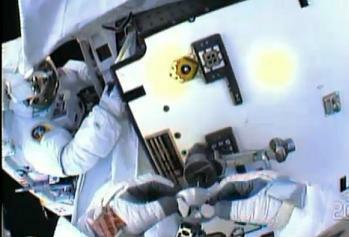 Lindgren then set up an ammonia vent tool and extender line on the P6 Truss. Kelly headed to the P1 Truss Ammonia Tank Assembly (ATA) and repositioned a jumper in order to make a connection between the ATA and the ammonia fill line. Lindgren then mated a jumper between the P5 and P6 Truss fill lines in order to begin the process of refilling the EETCS. Following this, Lindgren opened a valve in the Early Ammonia Servicer (EAS) jumpers to begin the process of refilling the PVTCS with ammonia. While there is currently enough ammonia in the system, the refill will increase ammonia margins to better tolerate future losses. While the ammonia refill was ongoing (taking around 20 minutes), Lindgren used his Pistol Grip Tool (PGT) to retract the isolated TTCR by driving a bolt approximately 50 turns. Once complete with this, he then closed the EAS jumper to complete the PVTCS ammonia refill. Lindgren then demated the P5/P6 fill line jumper to terminate the EETCS ammonia refill and connected the jumper to the vent tool in order to vent the fill line of ammonia in preparation for stowage of the line. This took around 17 minutes. Meanwhile, Kelly was hard at work reconfiguring the Starboard Crew Equipment Translation Aid (CETA) cart by folding and tying two brake handles, attaching a coupler to a swing arm, and driving a bolt to remove the swing arm. 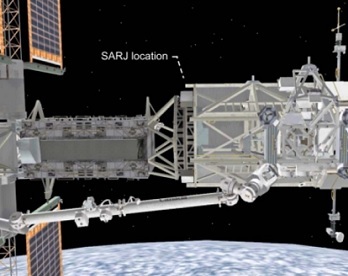 The swing arm was then stowed on the Temporary Equipment Restraint Aid (TERA) on the back of the S0 Truss. This CETA cart reconfig allows the Mobile Transporter (MT) with attached CETA carts to translate to Worksite-1 (WS-1) while still allowing for SARJ rotation, by removing interference issues between the CETA cart and the SARJ. Following this, both spacewalkers then headed to the P4 SARJ and drove bolts on two struts, in order to attempt to reduce some vibration signatures that ISS flight controllers are seeing on the P4 SARJ. 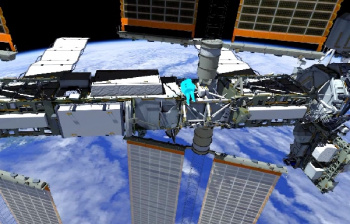 Kelly then removed the P3/P4 ammonia fill jumper across the SARJ, and Lindgren demated the P5/P6 fill jumper from the vent line, and stowed the vent tool and extender line, which will remain stowed outside the ISS as it contains traces of toxic ammonia. 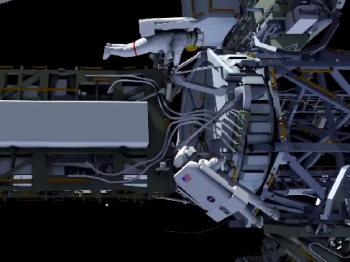 Both spacewalkers were then to install cinches on the retracted TTCR in order to secure it before installing a thermal cover on the TTCR in order to protect it from the space environment. However, due to time constraints, controllers opted to re-extend it, rather than secure it. Controllers are happy the TTCR will be fine back in this configuration until it’s stowed on a later date. The duo then retrieved all their bags and headed back to the airlock. On the way back, Lindgren reconfigured the ATA jumper to disconnect it from the fill line, and connect it to the vent position, in order to allow for a vent of the ATA if ever an overpressurisation situation occurs. The EVA concluded after an extended duration that totalled seven hours and 48 minutes. (Images: via NASA and L2 ISS Section).